BARE "BARE-LY LEGAL" is a meditative and intoxicating blend that evokes the inspiring ambiance of a garden full of white tuberose blossoms, Lilac, Gardenia and rare blossoms from all over the world. Lose track of time as layers of exotic sensual blossoms transport you to a haven of thoughtful tranquility. This portable and affordable luxury is 100% vegan and not animal tested. Traditional beeswax and borax body butter with origins dating BACK 100 Years. Over 98% natural, highly emollient and having over 50% oil content. Historically, this was called night cream or waterless cream in Eastern Europe. BARE-ly Legal 4 oz. arrives, as do the other skincare products, in an amber plastic jar with silver top that looks very simple, but attractive. But the main attraction is what's inside: a very hydrating, super-thick and rich cream that smells like tropical flowers and spices: White Gardenia, Tuberose, Taratahi Lilac, Ylang Ylang, Jasmine, Orange Blossom, and Black Coconut. It's a traditional, beeswax and borax body butter that purports to be over 98% natural (ingredients are listed below). The product is over 50% oil and if your skin is dry, you won't believe how quickly and effectively it works to eliminate every flake and itch and dry patch. You can definitely use it on even the toughest areas to moisturize, including "rhino-hide" feet, elbows and knees.You only need a tiny bit, and you'll find it is more like a solid pomade than a cream. The added bonus, especially if you use it on your feet and legs, is that the strong, exotic scent wafts up and will even mask (stinky) foot odor. So what is in it? : Helliantus Annuus (Sunflower) Seed Oil, Soja Hispida (Soya Bean) Oil, Simmondsia Chinesis (Jojoba) Seed Oil, De-Ionized Water, Natural Beeswax, Emulsifying Wax NF, Sodium Borate, Aloe Barbadensis (Aloe Vera) Leaf Juice, Fragrance, Chamomilla Recutita (Matricaria) Flower Extract (Chamomile), Disodium EDTA. Phenoxyethanol and Caprylyl Glycol. 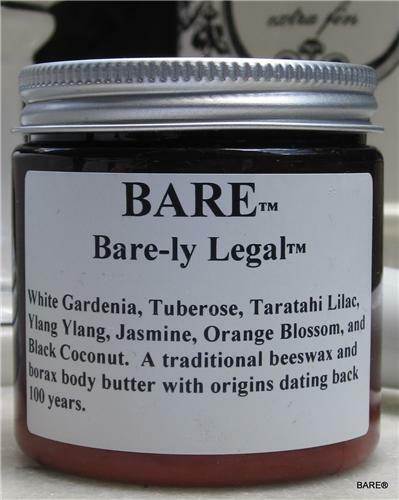 The Bare-ly Legal Body Butter has to be one of the best body butters I've ever tried. The vegan blend of beeswax & Borax moisturizes, dries quickly & smells amazing. With hints of white gardenia, jasmine & orange blossom, this body butter screams summer. Actually, I'm already planning on this being one of my summer staples.